Born Aug 25 18561,2,3,5,6,7,8,9, Winterset, Madison County, Iowa1,2,3,5,6,7,8,9 [Kansas Territory10]. Henshaw, Elihu, age 23, born in Iowa; father born in Indiana; mother born in Missouri; farmer. Henshaw, Nannie, wife, age 21, born in Indiana; parents born in Indiana; keeping house. Henshaw, A.M., son, age 3, born in Kansas. Henshaw, M.L., daughter, age 1. Henshaw, Elihu W., head-of-household, age 43, born Aug 1856 in Iowa; father born in Germany; mother born in Virginia; married 24 years; farmer; rented farm. 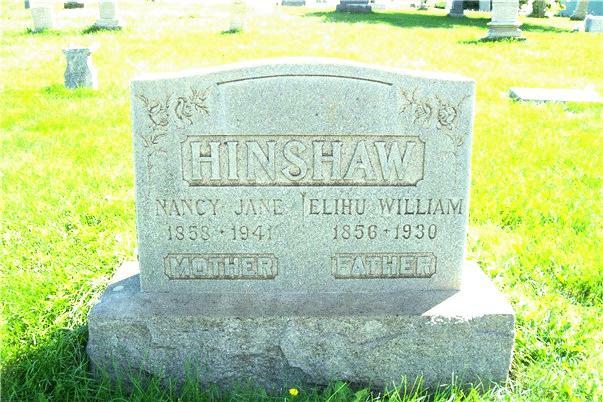 Henshaw, Nancy J., wife, age 41, born Aug 1858 in Indiana; parents born in Indiana; married 24 years; 6 children, 6 living. Henshaw, Andrew M., son, age 23, born Feb 1877 in Kansas; father born in Iowa; mother born in Indiana; occupation: farm laborer. Henshaw, Mary, daughter, age 22, born Aug 1878 in Kansas; father born in Iowa; mother born in Indiana. 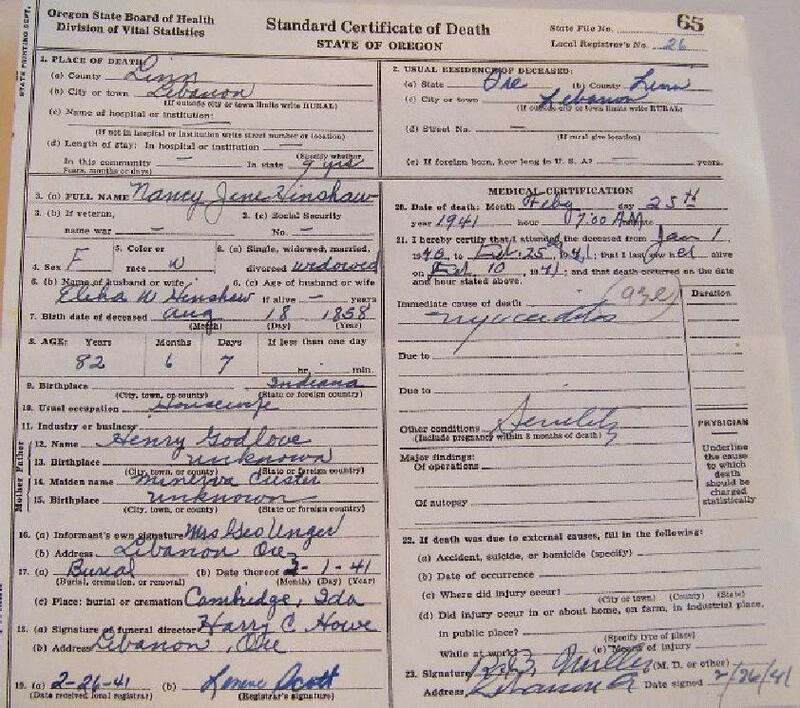 Henshaw, Lucretia, daughter, age 17, born Sep 188? [unclear] in Kansas; father born in Iowa; mother born in Indiana. Henshaw, Ida, daughter, age 15, born Dec 1884 in Idaho; father born in Iowa; mother born in Indiana. Henshaw, Henrietta, daughter, age 13, born Feb 1887 in Idaho; father born in Iowa; mother born in Indiana; attended school 5 months. Hinshaw, E.W., head-of-household, age 53, born in Iowa; parents birthplaces unknown; married 33 years; occupation: farmer; owned farm (mortgaged). Hinshaw, N.J., wife, age 52, born in Indiana; parents born in Indiana; married 33 years; 6 children, 5 living. Hinshaw, Elihu, head-of-household, age 63, born in Iowa; father born in Iowa; mother born in Missouri; owned home; farmer. Hinshaw, Nancy J., wife, age 61, born in Indiana; parents born in Indiana. Elihu William Hinshaw died Mar 9 19301,7 [Mar 5 193020], Cambridge, Washington County, Idaho1,7; buried Plot 1B 11, Salubria Cemetery, Cambridge, Washington County, Idaho1,7. Hinshaw, Nancy J., head-of-household, age 71, born in Indiana; parents born in Indiana; widow; first married at age 18; owned home ($800 value); radio in home; occupation: none. Conway, Lucretia, daughter, age 47, born in Kansas; father born in Iowa; mother born in Indiana; widow; first married at age 21; occupation: none. Conway, Lucretia, head-of-household, age 57, born in Kansas; completed 8th grade; on Apr 1 1935 was living in the same place/city; widow; owned home ($1000 value); $0 wages in 1939. Hinshaw, Nancy, mother, age 81, born in Indiana; completed 8th grade; on Apr 1 1935 was living in the same place/city; widow; $0 wages in 1939, plus other income. Nancy Jane Hinshaw passed away in Lebannon [sic], Ore., on Feb. 25, 1941 at the age of 82 years, 6 months and 7 days. She was married to Elihu W. Hinshaw. They lived in Kansas until 1882, when they crossed the plains by wagon train, settling in Idaho. To this union five girls and one boy were born. One daughter passed away in 1905. Mr. Hinshaw died in 1930 at which time Mrs. Hinshaw moved to Oregon. She is survived by 4 daughters, Etta Unger, Lucretia Conway and Maggie West, all of Oregon, and Mary Cape of Idaho, and one son, Milton of Idaho. Also three brothers, Ike Godlove of Soldier, Kans., Ole Godlove of Montana and John Godlove of California. 1930 census, Weiser Forest, Cambridge Precinct, Washington County, Idaho; roll T626-404, ED 18, page 1B, line #68, dwelling #21, family #21. 1910 census, Salubria Precinct, Washington County, Idaho; ED 276, page 211 (sheet 11), line #10, dwelling #157, family #159. Contribution from Hope Phillips (). 1870 census, Louisville P.O., Vienna Township, Pottawatomie County, Kansas; roll M593-441, page 462, line #33, dwelling #99, family #99. 1860 census, Louisville P.O., Vienna Township, Pottawatomie County, Kansas Territory; roll M653-352, page 551, line #6, dwelling #345, family #271. 1940 census, Lebanon, Linn County, Oregon; roll T627-3371, ED 22-28, page 5B, line #50, household #131. 1880 census, Mill Creek Township, Pottawatomie County, Kansas; roll T9-393, ED 239, page 218C, line #34, dwelling #210, family #223. 1880 census, Mill Creek Township, Pottawatomie County, Kansas; roll T9-393, ED 239, page 218C, line #41, dwelling #211, family #225. 1920 census, Cambridge, Washington County, Idaho; roll T625-294, ED 182, page 5B, line #83, dwelling #104, family #106.